Folks here call the Carrollton neighborhood of New Orleans, Kar•ul•ton, a tract of land that extends from a bend in the river where Saint Charles avenue and S. Carrollton avenue meet. For me, it has been home for the past two years. I got on the car at Willow today, near the Nix branch of the New Orleans Public Library, God I love that small municipal library with few books but tons of character. I'd work here. 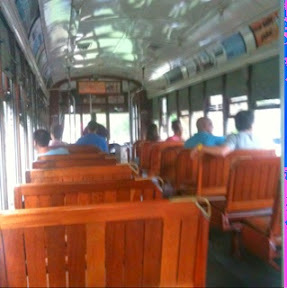 There were only three riders today on the Saint Charles Streetcar, so I sat at the back. 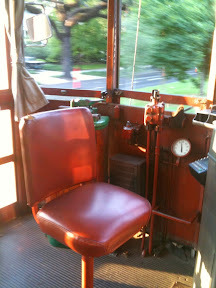 The conductor's seat is located in both the front and the back of the car. That way, the conductor can easily switch places without turning the car around when he gets to the end of the line. Summer time is New Orleans down time. Everyone's at the corner pub downing a bitter IPA or a soft Magnolia lager known to be pretty damn tasty. The Saint Charles streetcar is a thirteen mile stretch. Along with the Canal line and the Riverfront line, NOLA boasts three lines. Most natives remember when the streetcar crisscrossed the city to Gentily, through the Bywater and the Lower Ninth. I've been reading about streetcar expansion lately. I like to look at maps of the city and see where the streetcars used to be. I'll be happy when the city finishes the federally funded transportation project to extend the Canal line to the Amtrack station. I'm counting down days like a man with a furlough. I plan to ride the Crescent in June to New York City. I want an ad job. I have to create a cover letter tonight to send out to some marketing firms. I did see a place to live in Washington Heights that was cool but I didn't hear back yet. 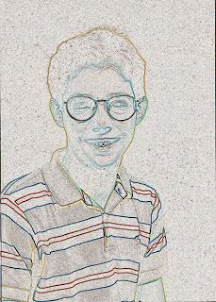 Peace out. The streetcar is stopping. Let me know when you get that job and the apartment.